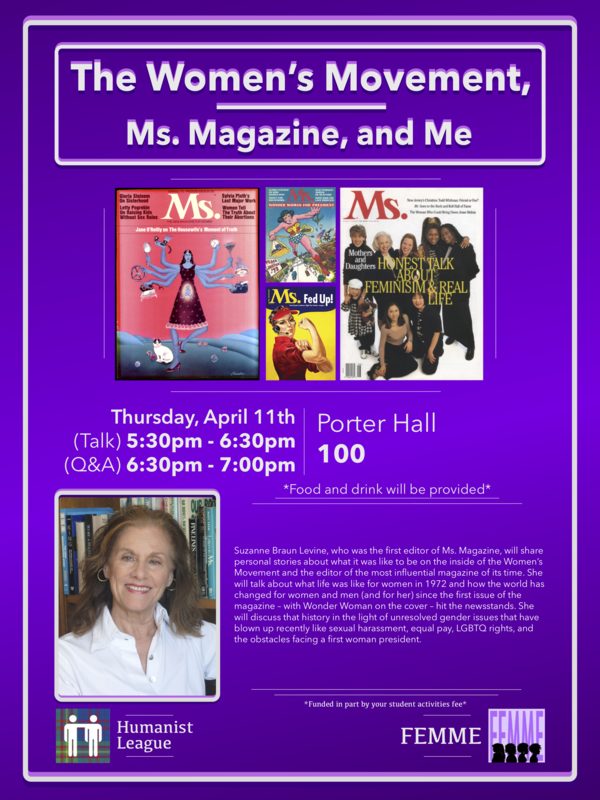 Join us at 5:30pm on Thursday April 11 in Porter Hall 100 to hear Suzanne Braun Levine discuss how the world has changed for women and men since the first issue of Ms. Magazine – with Wonder Woman on the cover – hit the newsstands. She will discuss that history in the light of unresolved gender issues that have blown up recently like sexual harassment, equal pay, LGBTQ rights, and the obstacles facing a first woman president. There will be a Q&A right after the talk from 6:30pm to 7:00pm. Suzanne Braun Levine was the first editor of Ms. magazine, and the first woman to edit the Columbia Journalism Review. While at Ms., Levine developed and produced the Peabody-Award winning HBO special “She’s Nobody’s Baby” She was honored as a “Ms. Woman of the Year” in 2004. She has written many books including Inventing the Rest of Our Lives, Fifty is the New Fifty, and How We Love Now. In 2016, she co-founded the Milford (PA) Readers and Writers Festival, an annual weekend of conversations between a line-up of prize-winning writers and their readers.